Goodfellow Terra® - Goodfellow Inc.
Goodfellow Terra® pressure treated wood products are designed for use in residential and commercial environments, where appearance and environmental protection standards are of paramount importance. Goodfellow Terra uses innovative MicroPro® wood preservation technology where copper is pressure treated into the wood in a solid micronized form, without the use of solvents. The MicroPro preservative technology is a waterborne, micronized copper azole (MCA) system developed to provide long-term protection for wood exposed in exterior applications. The MicroPro system is based on the well-established effectiveness of copper combined with an azole compound and is applied to wood by pressure treatment. Copper and azoles are effective fungicides and termiticides, protecting the treated wood from fungal decay and termite attack. Goodfellow Terra treated wood can be used above ground, in contact with the ground and immersed in fresh water. The preservative protection of Goodfellow Terra Pressure Treated Wood is backed by a residential limited warranty against fungal decay and termite attack. For more information, view or download Lifetime Residential Limited Warranty. MicroPro technology reduces the environmental footprint of Goodfellow Terra to less than half that of traditional residential treated wood. The MicroPro treated wood process was the first, and is the only, wood treatment process to be certified by Scientific Certification Systems as an Environmentally Preferable Treated Wood Process, based on Life-Cycle Assessment. MicroPro preservative technology also meets the stringent standards of UL GREENGUARD GOLD certification for low VOC emissions. Goodfellow Terra pressure treated wood is suitable for use in schools, offices, and other sensitive environments. For more information, view or download Environmental Certifications. During the pressure treating process Goodfellow Terra is infused with colour pigments, giving the wood an earthy rich tone of tropical hardwoods that enhances the grain and natural character of the wood. Goodfellow Terra comes ready to install in a rich, natural colour. It will provide at least 2-3 years of good colour performance (varies with exposure and application). Goodfellow Terra has superior colour retention when compared to all other brown treated wood product currently available. Pressure treating protects Goodfellow Terra against structural failure due to rot, fungal decay and termite attack. However, the surface of any wood exposed outdoors, treated or not, needs to be protected from the effects of weathering, such as warping, checking, splitting and colour fading. Applying a high-quality water repellent or stain with water repellent can help reduce these effects. A colour-matched Goodfellow Terra brush-on sealer and moisture repellent is available for cuts and holes in the wood that expose untreated wood. For more information, view or download Goodfellow Terra Sealer for Cuts in Pressure Treated Wood. Goodfellow Terra pressure treated wood products using MicroPro technology show significantly improved corrosion rates on metal products, similar to untreated wood. Use fasteners and hardware for exterior construction that are in compliance with the manufacturer’s recommendations and the building codes for their intended use. Aluminum building products may be placed in direct contact with Goodfellow Terra pressure treated wood products for interior uses and Above Ground exterior applications such as decks and fences, where the wood is not exposed to frequent and prolonged wetting. Goodfellow Terra pressure treated wood products in direct contact with aluminum products should only be used in code compliant construction applications that provide proper water drainage and do not allow the wood to be exposed to or remain in contact with a continual moisture source, standing water or water immersion, such as fresh water docks, hot tubs and swimming pools. 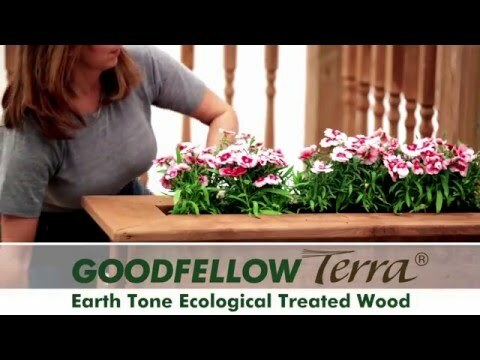 In addition, Goodfellow Terra pressure treated wood products should not be encased, sealed or wrapped with aluminum products where moisture or water can be trapped, to avoid pitting or other undesirable results. For more information, view or download Goodfellow Terra Fastener and Hardware Information. *Actual product colour may vary from colour shown in photos.